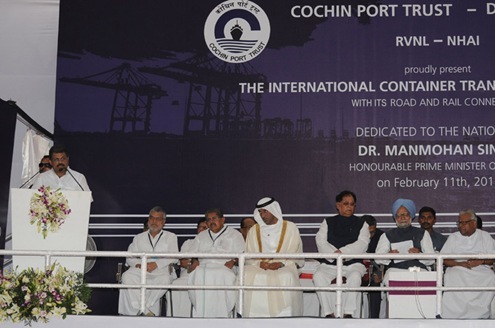 On February 11, 2011 International Container Trans-shipment Terminal (ICTT), Vallarpadam was dedicated to the Nation by Dr. Manmohan Singh, Prime Minister of India at Cochin. Developed by Cochin Port Trust and M/s India Gateway Terminal Pvt Ltd (IGT), a subsidiary of M/s Dubai Port World (DPW) through a Public Private Partnership on Build Operate and Transfer (BOT) basis. The foundation stone for ICTT was laid in February 2005. Being built at a cost (including road, rail connectivity and other infrastructure facilities) of more than USD 600 million or around INR 3,000 crore. DP World Cochin is being developed in three phases. First phase – completed with an investment of approximately Rs.1600 crores: with the 600-metre-long quay with a draught of around 14.5 metres to simultaneously berth several of the world’s largest container ships (with a nominal capacity of around 10,000 TEU – twenty foot equivalent container units) with the capacity to handle one million TEUs annually. Second phase: to be expanded in line with market demand to handle around 1.5 million TEUs. Third phase: to be completed with the capacity to handle around 4 million TEUs with quay length of 1800 metres. DP World also operates terminals in Mundra, Nhava Sheva, Chennai and Vishakapatnam. A new terminal facility in West Bengal is also coming up. Here is the inauguration photograph released by Press information Bureau (PIB). The Union Minister for Shipping, Shri G.K. Vasan addressing at the commissioning of International Container Trans-shipment Terminal, at Vallarpadam. View also the Inauguration Video.